Evaporator is an important component together with other major components in a refrigeration system such as compressor, condenser and expansion device. 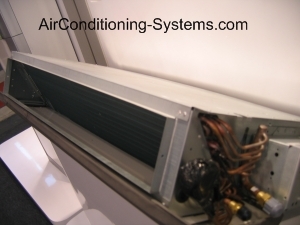 The reason for refrigeration is to remove heat from air, water or other substance. It is here that the liquid refrigerant is expanded and evaporated. It acts as a heat exchanger that transfers heat from the substance being cooled to a boiling temperature. Forced Convection Type uses a fan or pump to force the liquid being cooled over the evap. Natural Convection Type has the liquid being cooled flows naturally to the evap. due to the density differences of the chilled and warm liquid. Bare-Tube and Plate Surface construction have the entire surface in contact with the evaporating refrigerant inside. Finned construction are bare-tube coils upon which fins(metal plates usually Aluminium) are being installed. A more detailed discussion on this type of design will be provided here. An indoor unit that contains finned evap. The fins are added to the bare-tube to increase the heat transfer capability. They act as heat collector that pick up heat from the surrounding air and conduct it to the refrigerant inside the tube hence improving the efficiency in cooling the air of the surrounding. They are best used in the air-cooling space where the temperature is around 34°F. Having fins mean the surface area for heat transfer has been extended. This means that the finned coils can have more compact in design compared to the bare-tube type of similar capacity. In summary, finned coils help to reduce coil cost, size and weight. Good thermal contact between the fins and tubes is a must to ensure efficient heat transfer. They can be soldered together. The other more practical method is to expand the fins by pressure such that they bite into the tube surface hence a good thermal contact is established.The spacing of the fin depend on the operating temperature of the coil. Low temperature application uses only 1 fin. In air conditioning application, 14-16 fins per inch may be used as long it is designed in such a way that frost does not accumulates in the coils.Excessive finning may reduce the capacity of the evap. by restricting the flow of air over the coil hence the design engineers must do a proper system calculation and simulation at design stage. There are 3 main factors to consider in designing an evap. Pressure Drop The evap. must have sufficient space for the circulation of the refrigerant without too much pressure drop between the outlet and the inlet. Temperature The evap. must have enough surface to absorb the required heat load in order to ensure the temperature difference between the substance being cooled and the refrigerant is not excessive. Liquid and Refrigerant Vapor The evap. must have enough space for the liquid refrigerant and the vapor to separate from the liquid.